So in a previous post I had shown a collection of anime card wrappers put together into a bag. 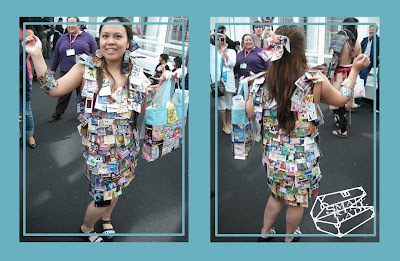 Anime Trading Card Bag But what to do with the cards? Then the hot glue (eeep, i did get some on the cards ~sniff sniff~) and glued each card onto the dress, starting from the bottom up. Using hot glue was a bad idea, besides destroying cards by accident. I was shedding cards like a dog sheds fur. People were trailing behind me picking up and returning my lost cards to me.